Published on Monday, July 30, 2018. This article appears in the June/July 2018 issue of American Craft Magazine. Cosmic Connection, assorted jewelry. 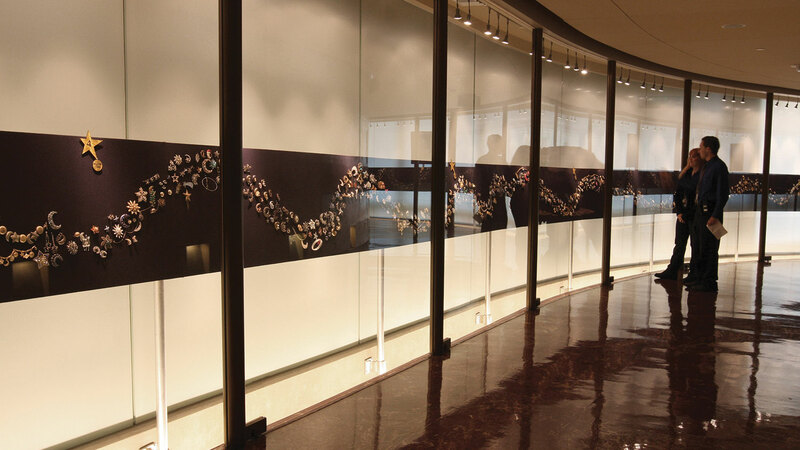 The piece is installed in a 175-foot-long hallway in the Griffith Observatory. Cosmic Connection, an installation of more than 2,300 pieces of celestially themed jewelry, drifts along a wall of the 175-foot corridor at Los Angeles’ Griffith Observatory. The stream begins with a big bang of tiny star pins and crescent moons, then unfurls in a trail of silver earrings, gold bracelets, and a great many rhinestones, accompanying and loosely illustrating a timeline of the universe, 13.8 billion years and counting. The bijou constellation captivates visitors because it “personalizes the grandest scales of the universe, and it does that in an unexpected way,” says E.C. Krupp, the observatory’s director. “Accessorizing the universe one light-year at a time” is how he describes his idea to place Cosmic Connection in the narrow hallway, part of a 2006 expansion. Most of the pieces are 20th-century costume jewelry – stars, moons, suns, comets – provided by Kara Knack, a longtime Griffith board member. Knack had long purchased heavenly jewelry to wear to public meetings as an advocate for the expansion, which took about 25 years to plan and build; she typically paid anywhere from a nickel to $50 for each item, which were destined for a yet-to-be determined exhibit when she started the practice. Some pieces are whimsical, others simply gorgeous. One section is devoted to star-shaped badges, such as those worn by law enforcement officials.